Despite some challenges of limited space and funding compared to larger counties, Tom Barrett with Columbia County animal services said he refused to let the thousands of animals that came in last year simply be put down. 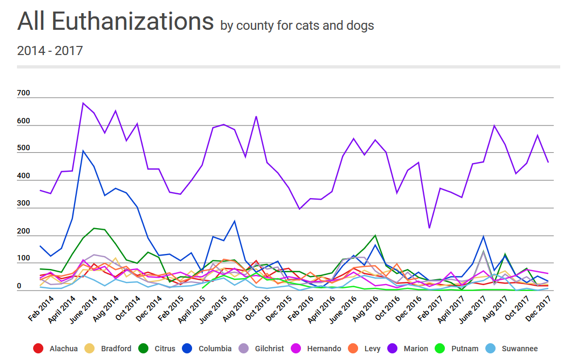 Public records for county animal shelters show that in recent years, euthanasia rates for cats and dogs have, for the most part, been on a downward trend in North Central Florida. In 2013, a new Florida law requiring county agencies to make it public record of how many animals are taken in, adopted out or euthanized went into effect. More than two weeks after it went into effect, a WUFT News investigation found that not all county animal shelters in North Central Florida were keeping track of these records. WUFT News spent the past three months following up on this data and requested the public records of monthly animal intakes, adoptions and euthanizations from March 2013 until the most recent month available. We requested the data from 12 counties – Alachua, Bradford, Citrus, Columbia, Dixie, Gilchrist, Hernando, Lafayette, Levy, Marion, Putnam, and Suwannee. Explore the intake and outcome trends in each county with these interactive charts. Marion County’s euthanasia rate has remained steadily above 50 percent since 2010. Of the nearly 10,000 dogs and cats brought in every year since 2013, more than 5,000 of them were euthanized each year. One of the reasons why: Marion is the fifth largest county in Florida. The 9,706 cats and dogs the shelter took in last year was more than double that of neighboring Alachua County, which had the second highest number of intakes. Marion County took in more animals in the month of August than Suwannee County did for the entire year. Still, Gilchrist, a much smaller county by total square miles, has also struggled with its euthanasia rates, averaging more than 40 percent since 2014. That means more than 500 of the roughly 1,300 animals the county shelter took in last year were put down. Ericka Hudson is one of two animal control officers who run the shelter. She said their kill rates are higher than surrounding counties because of the number of animals that owners bring in. Last year that number was 609 cats and dogs on top of the 670 stray animals they took in. Most county animal shelters either don’t accept animals from owners or charge a fee, but not Gilchrist. “I’m doing the best I can. There may have been a time I had to pick the best dogs to save because of space.” —Ericka Hudson, Gilchrist County animal control officer. Like other county shelters, she also reaches out to private rescues that help place the vast majority of her animals. Despite Marion and Gilchrist Counties, most other county shelters have seen substantial decreases in euthanasia rates since 2014 and even larger decreases when compared to 2010. Columbia County’s euthanasia rate went down by 87 percent since 2010 while Citrus declined by 70 percent. Bradford County saw a 41 percent drop from 2014 to 2017. Only three counties have been successful in nearing no-kill shelter status, meaning their euthanasia rates are less than 10 percent – Alachua, Suwannee and Putnam. Suwannee recently qualified as a no-kill for only having a 4 percent euthanasia rate since September. No-kill shelters only euthanize animals if the animal is severely ill or deemed too dangerous to be adopted. Alachua County Animal Services has decreased its euthanasia rate by 91 percent since 2010. It had a 6 percent kill rate in 2017, which means 268 animals were put down out of the 4,647 taken in for the year. Ed Williams, director of Alachua County Animal Services, said the decline started even before he came to the shelter in 2000 because the county partnered with Maddie’s Fund. Last year’s 1 percent kill rate for Putnam County wasn’t normal compared to a few years ago. Before Putnam County Planning and Development took over control of the county animal shelter from the sheriff’s office in April of 2015, the county euthanized about 25 percent of its dogs and cats. “When we took over, we had commissioner Chip Laibl who really wanted to push the initiative of a no-kill shelter,” Kevin Powell said. He now oversees the shelter. Less than a year later, Powell and his staff dropped the euthanasia rate enough to qualify as a no-kill shelter. Last year’s 1 percent kill rate meant they only had to put down 17 animals the entire year, most of which were either too sick or deemed too dangerous to live. “By being a no-kill shelter, the relationships we have with the various animal rescues throughout northeast Florida [allow us] to place the animals,” Powell said. Dixie County was the only one to not fulfill WUFT’s public records request for intake and euthanasia numbers. Vernon Long, a Dixie County Sheriff’s Office animal control officer, said he keeps records of intakes and euthanizations but not adoptions because the county does not adopt out any animals. 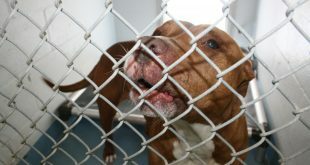 Any dogs and cats the county receives are either claimed by the owners or euthanized. Long and the sheriff’s office would not provide WUFT with any numbers, despite multiple requests. Levy County provided numbers for 2014, 2015 and 2016, but did not provide any records for 2017 or 2018. The Lafayette County Sheriff’s Office said it has not had a county animal service in years and does not handle any stray animals. With each county comes new challenges, different resources and unique situations that a one-size-fits-all-solution doesn’t solve. Work with local rescue shelters. Make it as easy and cheap as possible to adopt an animal. Promote pets online that are up for adoption. Have a robust trap, neuter and release system for stray cats. Garner support from the community and local policymakers. Every few years, Dr. Levy assembles a small team that sets out to collect public records from every single animal shelter in the state. 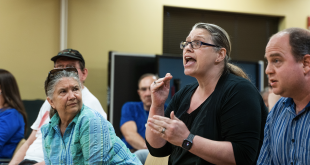 In 2016, the 151 shelters she received data from showed the state had a 27 percent euthanasia rate, with shelters bringing in more than 400,000 cats and dogs. The Suwannee County Animal Shelter has only put down 19 animals since September. Before that, it had a kill rate of more than 30 percent, euthanizing dozens of cats and dogs per month. But September was also the month Meghan Hale was hired as one of two animal control officers for the county. In just eight months, she’s helped save countless animals. 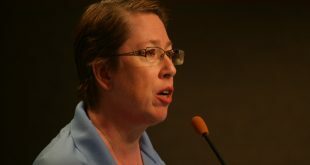 Hale also enlisted the help of Dr. Levy when she first came on the job last year. So now, Marion County is also asking for Dr. Levy’s help to solve its overcrowding and high kill rate. Tom Barrett said local politicians and the public may not always think as much as they should about what happens to animals after county services takes them off the streets. And while this problem may have a lot to do with cats and dogs, he says it’s a much larger issue. The goal of Senate Bill 674 in 2013 was simple: Reduce euthanasia rates and stray animals while increasing adoption rates. It garnered bipartisan support, passing both the Florida House and Senate unanimously that year and Gov. Rick Scott signed it into law. 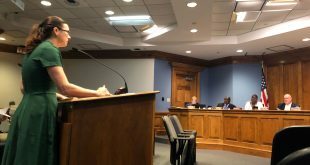 The theory was that by requiring county animal services to keep track of monthly records, shelters would be more conscientious of adoption and euthanasia rates. The law also required for that information to be made available to the public. “We need to make sure that throughout Florida, we have correct data and accurate data and make sure it’s available to the public,” Sen. Bill Montford, one of the bill’s authors, told News4Jax in 2013 after the law took effect. It did not include any type of enforcement for agencies who either don’t keep records or fail to provide them to the public. It’s essentially up to each county whether they choose to follow the law or not. WUFT reached out to Sen. Montford to ask what he thought of the implementation of his bill five years after it became law, but we were unable to reach him as of Monday. Deborah Horvath said it’s crucial to keep track of monthly records, so much so that Marion County even has their own software program to keep track of every animal they come in contact with on a daily basis. They are trying to say their euthanasia tactics are down, this is not tdown they are just shipping to another county to do their dirty work. Who do you actually think your kidding. The complaints I. Marion County has got you worried, they want to know why so many healthy pets are killed. So now instead of you showing the public record you ship them off to another county to make it look like you did not euthanize and let another county not under the gun do it for you.. really!???? Really ? Shipping to another county so they can do the dirty work for Marion County. You are trying to actually convince people that you have the best interest in these pets? Marion county has one the highest rate in euthanizing pets, healthy ones. You are trying to convince the residents that these pets are now being shipped for their well being ? Really why so another county can euthanize for you. The sites like Marion County lost and found pets FL on Facebook is the reason many are getting home and the people of Marion County are aware of the killings at MCAS. PLease don’t kid yourselves, we the residents are so aware of your tactics because the residents are putting you under the gun!!! Healthy pets killed at an unbelievable rate Its public record request it for yourself and see what has taken effect and now they want the other counties to do their dirty work. !